I think I, like many other creatively inclined folks out there, struggle with my lack of artistic output from time to time. It’s actually something I’ve been trying to deal with for years; frequently living in a well of procrastination and stagnation. I’m sure many of you feel similarly; you do your client work or go to your day job, expend a lot of your energy (creative or otherwise) and then feel tapped out with little or nothing left to get yourself working on that new idea you’ve had kicking around. Or maybe, you have just been going through a period where you seem to be devoid of any creative ideas you deem worthy of your attention. Both are familiar territory. Since I was running low on time to concept and shoot a personal piece, I decided a good creative exercise might be to look at any little bits I might have lying around and see if I could throw something together. I travel frequently for work and spend a lot of time staring out the windows of airplanes. As a result, I wound up with a backlog of some pretty neat footage of clouds that I shot on my iPhone 5 using the app Filmic Pro. If you shoot video on your iPhone and haven’t heard of this app, I highly recommend you check it out. I wrote and recorded a quick musical idea and put some of the footage against it. It looked nice, but wasn’t as compelling as I’d hoped. It needed something…more. I’ve been a fan of animation for a long time and am completely enamored with what Pixar has done with the medium. I have kicked around several animation ideas in the past and have sketched out a few characters here and there. I figured since I was basically winging this entire project, I’d try and integrate an animated element into the piece. 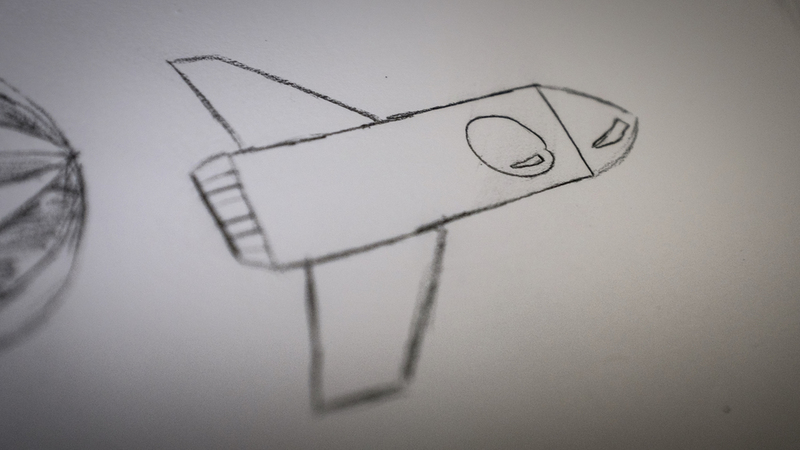 Since “Flight", as the title implies, is about the feeling of flying, I quickly sketched out a quirky rocket ship on a piece of paper. Then, using Adobe’s new app, Shape, I snapped a picture of the sketch, created a vector and added it to my Creative Cloud library which synced up to my main computer. From there I brought the rocket ship into illustrator, colored it in and then imported it into After Effects to animate. I used some lens flare and a particle system to create the output from the engine and wallah! All of a sudden I had something super fun and unique to create with. I thought it might be interesting to get a 2D object to negotiate movement in a 3D space, so I constructed some flight paths and moves for the ship that would clearly show that this is a flat object living in our 3D world. All in all the film is a great little mash up of live footage, 2D animation and 3D VFX. I’m really happy with how this piece turned out and it accomplished exactly what is was supposed to; it got me out of a creative funk and got me making something. I think there is something tender about it while still remaining playful. Sometimes we blur the lines of reality and dreams, where our imagination takes hold and the impossible becomes possible. Have you ever looked out of an airplane window and become lost in the wonder of being high above the Earth? "Flight" is a daydream where we can get lost in that feeling, where we can feel like kids again and ask, "What if I could fly?" I hope you enjoyed. Until next time.